Tis the time's plague when madmen lead the blind — Gloucester, whose words like so many of Shakespeare's nowadays bring our current head of state to mind. 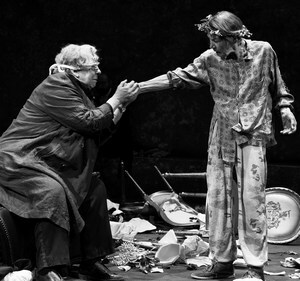 King Lear at the Cort Theatre will be most remembered for Glenda Jackson's Lear. The British actor's portrayal of the foolish old king is an indelible study of a monarch in spiritual crisis. While Gold's direction doesn't always serve his actors, Jackson's performance in the nominal role is sublime. Those who have seen Gold's stage work (see Elyse's review for links to some) will recognize his fingerprints in the current Lear. The contemporary set, the modern-dress, the casting of an actor with a disability (the excellent deaf actor Russell Harvard plays the Duke of Cornwall), all are in evidence here. The play's pulse has been enriched by Philip Glass' thematically related score which is performed by a roving string quartet on stage. Though it sounds quite splendid, it more often than not it distracts from the proceedings. And why gild the lily? Shakespeare's language is so inherently musical that it hardly needs to be overlaid with instrumental music. Using a marbleized gold set with fitting royal accoutrements (by Miriam Buether) and handsome costumes (by Ann Roth), Gold projects a picture of Lear's opulent palace in the opening scene, which later will morph into his daughters' palaces. For the famous Act 3 storm scene, Gold has a metallic wall materialize downstage and pushes the action to the lip of the stage. Although I've seen far more spectacular storms in other Lears, Gold seems to be underscoring that the real storm is located not in the geographic landscape, but in Lear's deeply troubled psyche. In the play's second half, the lights go up on a stage strewn with shards of broken furniture. Is this supposed to be an apocalyptic landscape? Or a symbolic rendering of the brewing battles between France and Britain? Or maybe the tragic divisions within Lear and Gloucester's families? Well, whatever it may be, it's too visually busy for the unfolding pivotal scenes in which Lear and Gloucester's undertake their separate odysseys to Dover. It also doesn't seem to add anything but confusion to the scenes when Goneril and Regan engage in their vicious sexual rivalry for Edmund's love. If the scenery comes up short, the acting doesn't. And who can top Jackson? She gives us a Lear who when the play opens wields absolute authority by a mere raising of an eyebrow. But it's also a performance that is shrewdly keyed into Lear's coming breakdown. The tragedy of Lear, after all, is that he discovers—too late—that he has trusted the wrong daughters and banished the one who truly loves him. Jackson captures this angst and reflects it in the king's facial expressions and every tendon and muscle of his aging physique. When it comes to the supporting roles, Ruth Wilson, who dually plays Cordelia and the Fool, is superb. And it's difficult to know which to admire more— her Cordelia or Fool. The versatile Wilson gives an alert, canny interpretation to her Cordelia and a sassy vaudevillian spin to her Fool. Too often director's overlook this double-casting opportunity in Lear but Wilson gives fresh proof that it works. Honors for the best Shakespearian chops in the support cast go to John Douglas Thompson who plays the devoted Kent. Jayne Houdyshell's Gloucester cuts close to the character's bone and sustains his prosy speech patterns throughout ("And that is true, I stumbled when I saw") throughout. She inhabits the Earl with no pretensions and manages to pull off the part with her plain-spoken delivery of lines. There are a couple of other actors who deserve kudos. Elizabeth Marvel as the villainous Goneril can make one downright shiver as she executes her character's toxic schemes. Pedro Pascal as the ambitious Edmund is spot on. The character of Edmund is a theatrical cousin to Iago, and just as treacherous. Although Edmund's moral compass does swing into action during the catastrophe as he attempts to save Cordelia from hanging, it's too late for his message to reverse Cordelia's death sentence. Now, for those wondering how the diminutive Jackson can possible manage to carry the dead Cordelia on stage in Act 5 . . . well, the answer is she doesn't. But helmer Gold has flexed his imaginative muscles here and devised some stage business that one must applaud for both its inventiveness and textual faithfulness. Yes, it's a bit surreal, but Jackson's Lear, deftly meets this dramatic moment. Perhaps the best way to appreciate Gold's new version of Lear is to savor the 82 year-old Jackson's star turn as the old and weary king. And wasn't it T. S. Eliot who provided this nugget of wisdom about staging Shakespeare: "It is probable that we can never be right; and if we can never be right it is better that we should from time to time change our way of being wrong." Since Curtainup's launch in 1996, every member of our team has reviewed at least one King Lear production. If you check out our Shakespeare quotation page, you'll see that adds up to some thirty Lears. Though I've admitted that Lear isn't my favorite king, there's no question that he is truly one of Shakespeare's greatest, most universal characters. And, given that the drama about the aftermath of his ill-conceived retirement keeps proving its adaptability to new interpretations, I've covered my share of Lears. — but not as many as Curtainup's chief Shakespeare enthusiast, Deirdre Donovan. Iat was therefore a special treat to attend a performance of the latest King Lear with Deirdre and share our thoughts on this latest incarnation. 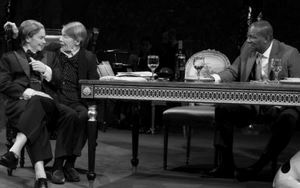 Undoubtedly having Glenda Jackson, last year's multiple award winner for Three Tall Women back to play the doomed King is filling every seat in the Court Theater, including even the high up second balcony. I think Jackson lives up all the hype about the gender busting role that brought her back to the stage after twenty-three years in Parliament. For me a cast that also includes John Douglas Thompson, Jayne Houdyshell and Elizabeth Marvel is also very special. As Kent, Gloucester and Goneril respectively, they more than lived up to my expectations and made the three hours of Lear's descend into madness pass without longueurs. On the other hand, having the Ivo Vanhov-ish director Sam Gold at the helm made my loving this production more iffy. Granted his innovations for Othello at New York Theater Workshop (review ) were very fine, as was his direction of new plays like Fun Home. But then there was his misconceived diddling with The Glass Menagerie . Actually, some of Gold's directorial tactics work pretty well here, though others, also detailed in Deirdre's review, tend to be more clunky and distracting than subtle; for example, Miriam Buether's gold palace with its rather obvious reminders of Donald Trump and Vladimir Putin's taste. . . Goneril's ultra contemporary sexual proclivities. . . the too heavy use of Philip Glass's music played by an onstage string quartet probably intended to serve as a Greek chorus. . . .
Gold's casting a partially deaf actor (Russell Harvard) as the Duke of Cornwall with another actor (Matthew Maher) using American Sign Language to deliver the dialogue between him and other cast member though somewhat distracting does somehow fit this character's moral tone deafness. However, unless that signing actor were on stage throughout, this is hardly more than a half-measure to make theater more accessible for deaf audiences. The one truly golden Gold filip for me was his doubling up the role of Cordelia and the Fool. According to frequent conversations among Shakespeare scholars like Deirdre, this is not an idea invented by Gold but the playwright's own intent to have Cordelia, like Kent, stick with Lear in disguise. At any rate, while I've never seen this done before, better late than never— especially since Ruth Wilson, (currently starring in a PBS 2-parter which happens to have a title character called Mrs. Wilson), is terrific. As Lear HAS been played by women before, the closest I've come to seeing this done was Olympia Dukakis by in Dennis Krausnick's The Lear Project in 1998. That still in progress work was never further developed and Krausnick himself played the monarch a few seasons later. At any rate, Jackson is of course fully in charge of her role. At 82, she's probably thinner and shorter than she was before her political hiatus from acting (people do tend to lose height as they age). But her Lear is very much a King which keeps the focus on his loss of power, and how his poorly planned resignation's ratched up the greed of his heirs and and left his kingdom in chaos. To sum up, this is indeed a not to be missed star turn by Jackson, with enough positive assets to overcome the directorial missteps. Cast: Glenda Jackson, Sean Carvajal, Russell Harvard, Jayne Houdyshell, Dion Johnstone, Matthew Maher, Elizabeth Marvel, Aisling O'Sullivan, Pedro Pascal, John Douglas Thompson, Ruth Wilson. Cort Theater W. 48th St.
. From 2/28/19; opening 4/04/19; closing 7/07/19 Tues-Sat at 7pm; Wed and Sat at 1pm; Sundays at 2pm..